Sydney – 11th July 2011 – Effective Immediately – Blue Pie is thrilled to announce a new signing with BreakIt! Radio & Broadcasting Association. Blue Pie is thrilled to announce that BreakIt! Radio & Broadcasting Association has now joined the roster. 97.6 BreakIt! Radio is an affiliate of ‘Breaking the Labels and BreakIt! Radio & Broadcasting Association’. The radio station is dedicated to giving exposure to Indie Artists and reviving Hip Hop culture of the music and rap industry. Each week after MixTape Mondays at the Skol Bar or after the Hip Hop Fest Events at the HOT TV Studio, BreakIt! posts Indie Artist features on the 97.6 BreakIt! Radio Feature Page. Artists who demonstrate professional readiness in this industry are highlighted on the website. Working together with Blue Pie, BreakIt Radio is ready to revive the Hip Hop culture of the world! Blue Pie, the record label, is one of Australia’s leading independent labels. The label has a wide and diverse range of alliances, global partnerships and proprietary technology that we make available to all our artists, labels and content partners. These relationships combined with our technology, systems and infrastructure allow our artists and labels to reach new and exciting fan bases and markets globally. Blue Pie is proud to represent over 80 labels and over 1300 artists worldwide. Bleek, The Devyl Nellys, Dale Bozzio, Dave Sharp, Serge Ermoll (ARIA Winner), Tony Hatch (Grammy Winner), Gordon Chambers (Grammy Winner), Janice Marie (Grammy Winner) Dave Evans (AC/DC), The Yeehaa Boys, Star Ship, John Enghauser, Evolution Eden, JP Ranger, Burning the Day, Sarah Saunders, the bLEED, Barry Crocker, Gordon Waller, Sheva, MLU, Dino Jag, and The Judes and to name a few. Search on ‘blue pie’ in Google for more information. If you are an upcoming artist or have a business… you have the ability to rocket launch your career or products and help youth at the same time. Read the details and respond to the email at the end of this post if you are business-minded, career ready! The Books Up Streets Down program encompasses an innovative way to engage youth in music to enhance positive strides and growth in their educational development. Thru the program we ignite the youth to stay focused on school. The program revolves around the arts and entertainment. We host events and bring volunteers to the schools to mentor youth and provide support to teachers and administration. Additionally, we host special events to raise community awareness and funds for the youth for books, resources, computer software and supplies. Saving Our Children Foundation (SOCF) offers a host of programs that we incorporate within the schools. More information on the programs we offer can be found on the SOCF Website. Innovate your entire approach!!!! Simple… easy… cost effective… and POWERFUL!!!!! Whether you are a business, artist, author, poet, DJ…. if you are in need of MARKETING and PROMOTIONS that WORK, this is a great opportunity for you! We will directly market your product to the public; placing your product directly into the hands of a potential customer or fan. 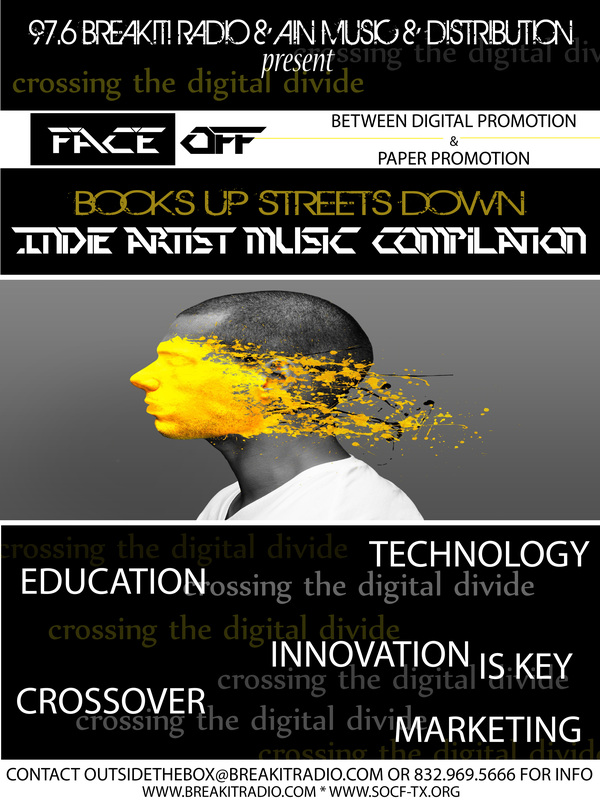 ARE YOU PURCHASING FLYERS TO PROMOTE YOUR MUSIC or BUSINESS??? STOP FOR A MOMENT and GET ON A DIGITAL COMPILATION that will NOT ONLY PROMOTE YOU BUT LOCK CUSTOMERS IN! Our products don’t end up on the ground or ran over in parking lots at clubs and grocery stores. 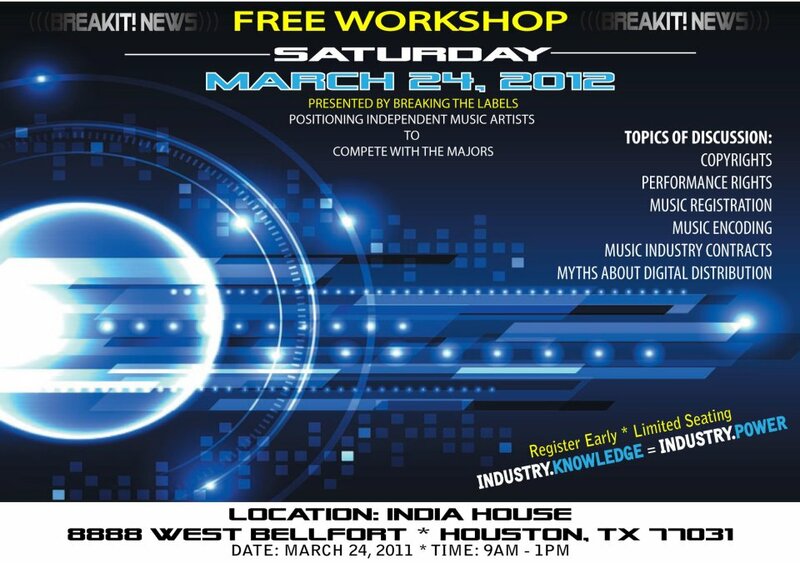 ARTISTS: This Opportunity gets you radio play on 97.6 BreakIt! 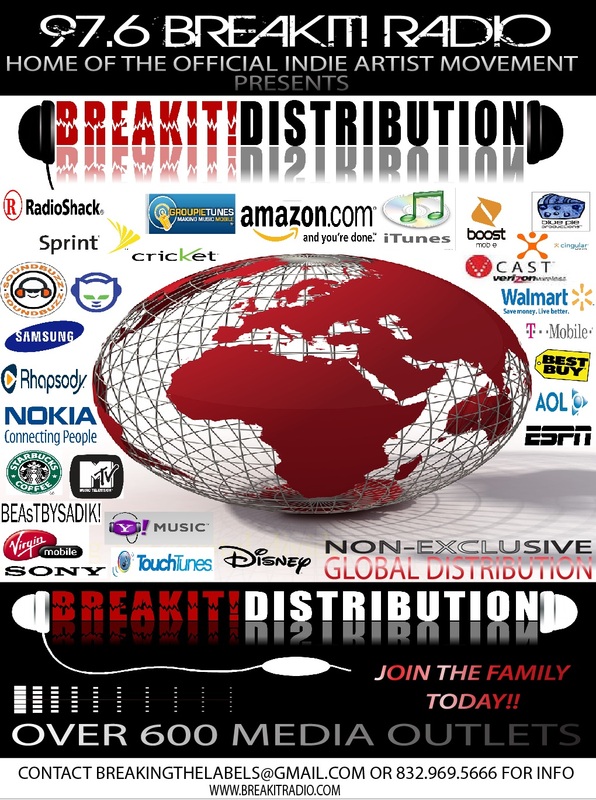 Radio and REGISTERED INTERNET STATIONS that we have pre-screened to get you PAID for your SPINS… ADDITIONALLY you have the ABILITY to SIGN UP for DISTRIBUTION with AIN Music & Distribution, a digital distribution company that can place you in over 600 Media Markets!!!! BUSINESSES: This opportunity will get you a radio drop on 97.6 BreakIt! Radio ran twice daily for a month. Are flyers or even Facebook and Twitter posts doing that… I doubt it!!!!! Very few people gain success with these methods alone. Now imagine… you can get innovative marketing for the same cost of 1,000 Flyers!!!! 1,000 Compilation Copies with your project reaching customers DIGITALLY!!!!! The INFORMATION AGE is the NEW KEY!!! The Compilations are utilized as give-a-ways to the public. As we promote you we also raise awareness for the program. Skilled volunteers, solicit donations from those who we market to directly. Customers do not have to make a contribution to receive the product, but many do. Those donations help finance the Books Up Streets Down programs. Additionally, give-a-ways are also utilized as incentives for students to succeed in school.